You may be one of the fortunate homeowners whose kitchen just needs an update instead of a full remodel. Cabinet refacing is an economical option that can give your kitchen a quick makeover in no time. Rather than gutting your cabinets and replacing them with new ones, cabinet refacing allows you to update the exterior of the cabinets you already have. It’s also a fabulous way to add contemporary design elements to your space, both with cabinet doors, colors and hardware. Let’s take a look at the latest designs in cabinet refacing. Before starting a project, determine if cabinet refacing is the best fit for your existing space, budget and long term plans. Refacing is an economical option for updating your kitchen’s aesthetic, but it relies on your existing cabinets’ framework. If there is extensive damage or signs of wear that could impact the longevity of the cabinets, a full remodel with new cabinetry may be a more sensible option. The cabinetry body should be able to withstand the refacing project and last at least 10 years. If your cabinetry was built with less durable materials or outdated craftsmanship, it may be better to look into a full upgrade instead. Utilize sleek designs and contemporary finishes when refacing your cabinetry to bring a modern touch to the heart of your home. Glossy cabinets can be paired with angular polished nickel pulls for a unique balance of sophistication and subtlety. When it comes to modern style, the simpler, the better. If you’re looking to make the complete jump to modern design, consider a frameless, full-overlay style cabinet when refacing. This style is used in most modern kitchens because it’s much more streamlined that a flush-inset cabinet and adds an extra bit of sheen. Add contrast with a spectrum of colors or finishes, and don’t be afraid to take advantage of pre-painted or repurposed options that give your kitchen space a little oomph. In homes where existing kitchens seem overtly traditional, contemporary cabinet styles and remodeled elements like beveled subway backsplash and consistent finishes help add a modern spark. To finish the look, keep the accessories and added accents to a minimum – mirrored glass, smooth textures and organic materials are the perfect complements to this kitchen style. The key to creating a transitional oasis is to play up crispness and natural surfaces. When refacing your cabinetry, look for styles that have a streamlined look just short of an ultra-modern aesthetic. For example, simple paneled doors made of wood with sleek hardware are the perfect transitional combination. Transitional kitchens also pair beautifully with glass paneled cabinet doors and toppers that bring the look of cabinetry up to the ceiling for a statuesque finish. Another style that fits this aesthetic is the classic Shaker door. It can be brought up to date by pairing contemporary elements like sleek bronze hardware with bright white Shaker cabinetry or a warm, classic wood finish. Wrap up your refacing project by paying attention to extra details that show off your new cabinets. A clean, neutral color palette is very characteristic of a transitional space, and typically features a monochromatic yet warm look with just a few bold punches of colors through accessories, dishes and upholstered furnishings like chairs or stools. Take your traditional kitchen to the next level with classic detailing and design elements that spark nostalgia. Architectural details are important to maintaining a traditional aesthetic. A bit of embellishment or adornment speaks volumes in a classic space, and any way to add moldings, arches and raised paneling is encouraged. Crown molding and posts add a mature look as well as much-needed depth and dimension. Beadboarding and paneling are great ways to bring the traditional aesthetic to your kitchen without having to add too many other elements. Other ways to create a classic aesthetic through refacing include glazed or antique finishes, flush inset or framed paneling and decorative door inserts. Then, take your kitchen from zero to 60 with a classic apron-front sink, ornate decorative lighting and a metal, plaster or stone range hood to pull out all of the traditional stops. All of the styles mentioned above feature new and evolving trends in the kitchen cabinetry world. Easy to install and even easier to love, refaced cabinets bring a whole new world of design elements to any kitchen remodel, from modern approaches like overlay designs to a traditional setting featuring antique finishes and classic beadboard techniques. What are some new refacing designs that you would add to your own kitchen? 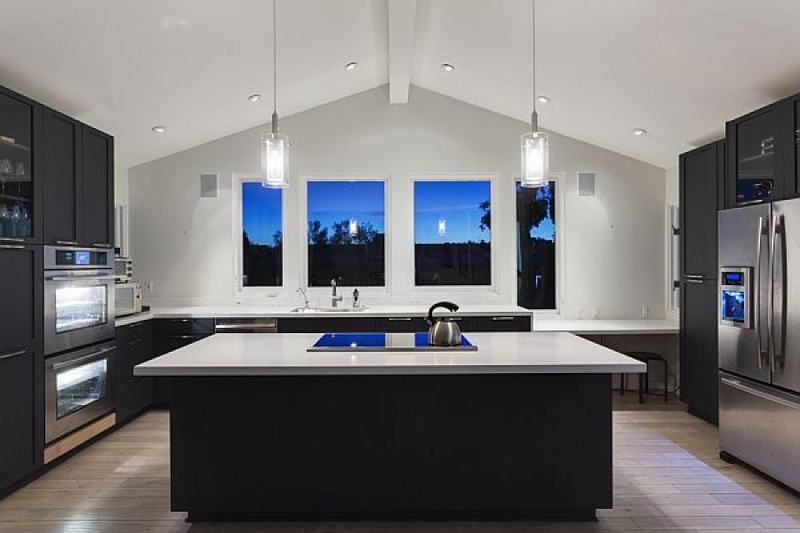 Kerrie Kelly is a Sacramento, California based interior designer who heads up Kerrie Kelly Design Lab. Kerrie provides design tips on topics such as updating your kitchen. She advises readers on everything from the color of the cabinets to the overall style to picking the hardware. To find out more about kitchen cabinet refacing, visit The Home Depot.